Adelsheim family makes Pinot Noir since 1970. I personally love Pinot Noir from this particular region the most. To me, that’s how the true Pinot Noir supposed to taste like (aside of Burdgundy, of course). Most of the grapes, sourced for Adelsheim Pinot Noir, came from their seven estate vineyards and about 25% from nine vineyards in other parts of the Willamette Valley. The secret to complexity of their wine is in blending several different clones of Pinot, (originally brought to Oregon from Burgundy) and several different soil types and appellations. Since each lot has vine of different age and sun exposure, it produces a different style and flavors of Pinot Noir as well. This diversity allows the winemaker to create a very unique blend. Since all the grapes weren’t picked at the same time, the final blend was created after each lot was destemmed, macerated, pressed and underwent a 7 – 10 days fermentation in open vats. After that the final blend underwent a malolactic fermentation in small French oak barrels. Wine was estate bottled and released after a few additional months of aging. 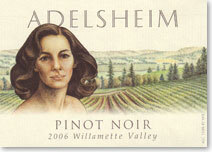 The portrait of Diana Lett on the Pinot Noir label was created by Ginny Adelsheim. It is a tribute to special woman, that together with her husband founded a first Oregon Pinot Noir winery (The Eyrie Vineyards) and as a thank you for her friendship. Beautiful light ruby color. Rich aroma of freshly crushed cherries and blueberries, mixed with oak spices and dust of cocoa. Just the right amount of acidity and soft tannins cause the desire for a second glass. Nice, long finish. Blending different flavors and styles of Pinot Noir as Adelsheim does, successfully competes with many single vineyard Pinot Noirs, carrying much higher price tag.